It’s the somewhat risqué Bikini Party slot which we’re going to focus our attention on here. Certainly aimed at a male audience, the game is set during a game of beach volleyball and has five bikini-clad main characters. Those volleyball players are the game’s most valuable symbols and top symbol combinations can pay a pretty penny for Bikini Party players. Free spins with a handy three times multiplier, what’s more, can boost potential winnings still further but are basically the slot’s only additional gameplay feature. The top main game jackpot pays out a tasty 160 times the total bet, meaning that a player could win a cool £60,000. The slot’s scatter symbols trigger 15 free spins, during which all wins are trebled to increase the game’s winning potential still further. 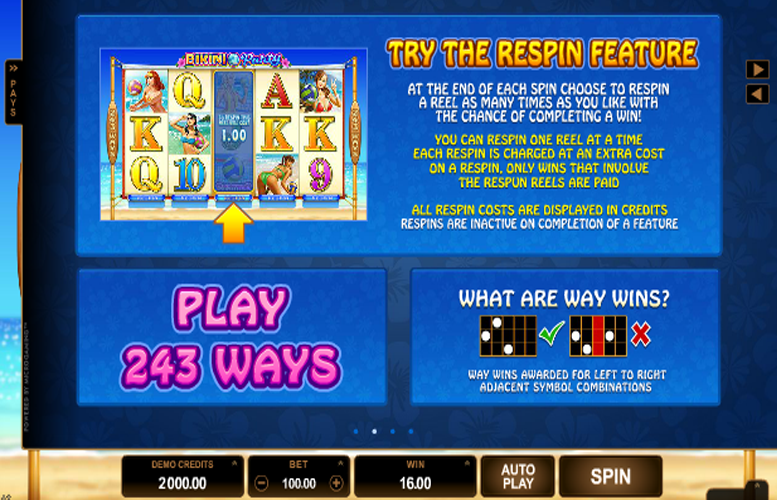 A respin feature adds a little extra skill element to gameplay, in that it lets players choose a reel to respin in order to try to achieve more valuable payouts. The game’s risqué (to say the least) theme means that it will only appeal to a very specific section of players and will put off at least as many, if not more. Other than the slot’s free spins and their related multiplier, Bikini Party is essentially devoid of any additional gameplay features. Unfortunately, Bikini Party does not have a bonus round or many other additional gameplay features. Aside from its free spins (discussed below) it only has a respin feature beyond the main game. That feature is a handy one, though, as it lets players pay to respin an individual reel as many times as they like, to achieve winning combinations. Only those combinations involving symbols on the respun reel are paid, however. If three, four or five of the Bikini Party scatter symbols – showing an image of a volleyball – appear anywhere on the reels, it triggers 15 free spins. 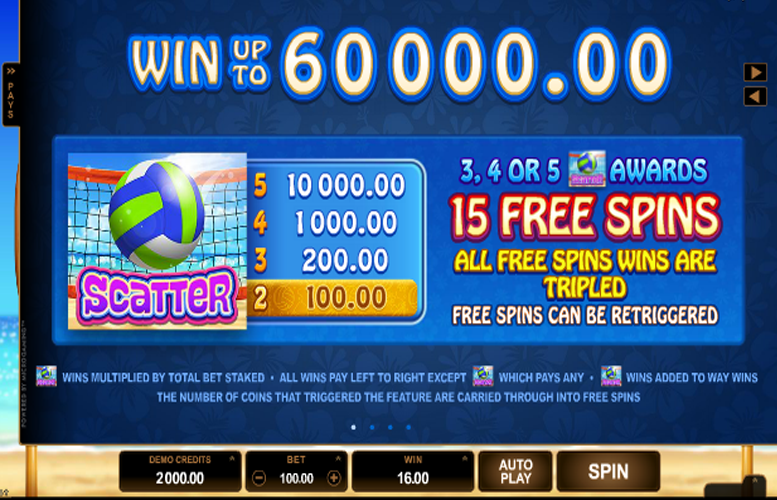 During the course of those free spins any and every win achieved by a player is trebled. What’s more, if the required number of scatters appear during free spins, a further 15 are tacked onto the end of those already being played. Whilst it’s unlikely you’d be playing cards during a game of beach volleyball, it is playing card figures which appear on Bikini Party’s less valuable reel symbols. The least valuable symbol of all displays the number nine and the best of those lesser symbols display a letter ‘A’ for ace. Five of the number nine symbols in combination are worth four times the total bet, five aces are worth eight times the bet and five of each of the other playing card symbols are worth somewhere in between. As Bikini Party is a 243 ways to win format slot, players alter the amount they bet by changing the number of coins they wish to wager and how much each of those coins are worth. Their choices then have a bet multiplier applied, which for this slot is 25x. Coin values of between 1p and 50p can be chosen, whilst anywhere from one to ten coins can be bet per spin. That makes the minimum possible bet just 25p (25 x one 1p coin) and the maximum possible bet £125 (25 x ten 50p coins). Bikini Party is probably best described as a Marmite slot game. Some players will love it, whilst others will undoubtedly hate it. Its theme is designed to appeal almost solely to male players, will put off most female players and will still appear boring and a little crude to many blokes to boot. In terms of gameplay, the slot is very simple and does not include the additional gameplay features or elements which many modern slots now swear by. Many players will see that as a major weakness but some, who like to keep things traditional, will see it as a significant plus. Bikini Party’s payouts are something which almost all players will be able to agree on, as they are impressively generous across the board. In fact, thanks to the game’s three times multiplier for free spins, a top jackpot of a cool £60,000 is available. This game has a rating of 3 / 5 with 266 total reviews by the users.